The old and the young experience the full spectrum of life at Providence Mount St. Vincent’s Intergenerational Learning Center. The little boy in a bright-green shirt tightly clenches a sandwich bag and asks, “Can you open this for me?” He thrusts the bag at the elderly man seated to his right. “Sure I can, buddy,” says 92-year-old David Carriere as his weathered hands reach for the bag and slowly tear at the opening. Satisfied, the little boy starts stuffing sandwiches into the bag. 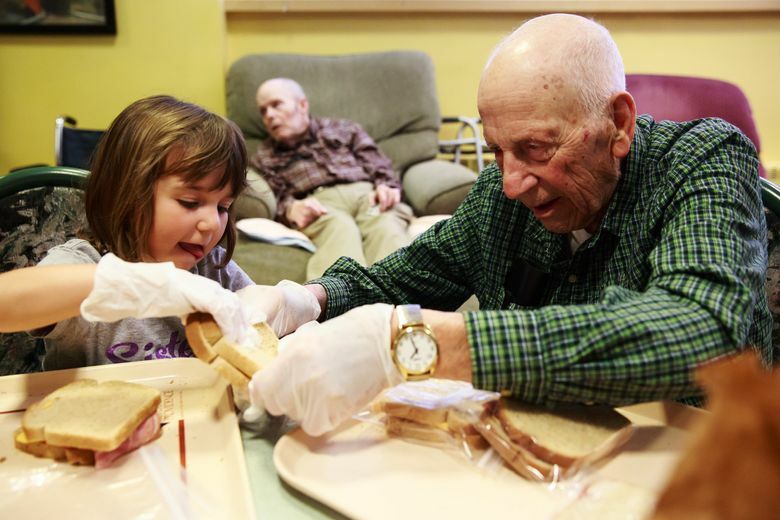 On a recent Friday at Providence Mount St. Vincent retirement home in West Seattle, a group of senior citizens and youngsters are packing sack lunches that will be delivered to the homeless. It’s one of many projects that bring the elderly and the young together through the Intergenerational Learning Center, a day care inside the retirement home. 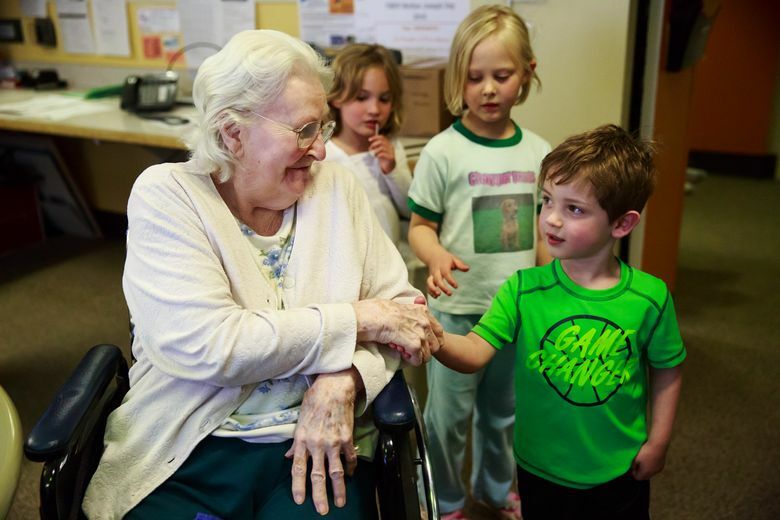 Five days a week, children ages 6 weeks to 5 years interact with Mount St. Vincent’s residents, whose average age is 92. Activities range from musical hour to story time to art classes. “We wanted this to be a place where people come to live, not come to die,” Boyd said. In 1991, Boyd was part of the team that decided to open a day care at the Mount, an idea that she and others thought would add to the “community” that the Mount strives to cultivate. Not only does interacting with children revitalize many of the residents and allow them access to a more “normal” and varied sphere, it also helps acquaint young families and children with the realities — positive and negative — of aging. Donna Butts, executive director of Generations United, a national group that advocates for intergenerational involvement, says the idea of intergenerational learning facilities has been around for about 25 years and shows enormous benefits. Older adults involved in the programs tend to be more optimistic, have larger social networks and better memories, and take better care of themselves, Butts says. For young people, extra attention from an older adult helps improve social skills, and reduces fear of aging. She says there are somewhere between 100 and 500 intergenerational learning facilities in the U.S., and the trend is on the rise as baby boomers look for stimulating and engaging care facilities for their aging parents. The ILC has proved to be a popular program. Currently, the day care is capped at 125 students and has a waiting list of two and a half years. ILC Director Marie Hoover, a former hospice provider, sees the intergenerational visits as an extension of the variety of experience that the school has to offer. Anecdotally, she says she hears often from parents who are amazed at their children’s ability to interact with the elderly and disabled outside of the classroom. “From the time you’re a baby to the time you die, you’re an individual who wants to be recognized and respected,” Hirami said. She says the children start to understand this through their daily interactions with multiple age groups — from the residents in the facility, adult volunteers in the Mount’s gift shop and thrift store, teachers, and teenagers who volunteer to run the convenience store. Smith recently graduated from Washington State University and is studying to become a firefighter. Eileen McCloskey, an activities director for some of the residents, says it’s unlike any other long-term-care environment she’s ever worked in. She says the residents’ “eyes light up” when they interact with the children. Victor Warkentin has two children, ages 5 and 2, enrolled in the program. He thinks the ILC philosophy, which stresses problem-solving, has had an enormous impact on the way they see the world — from being able to problem-solve to being more comfortable explaining their feelings and taking new chances. Recently, Warkentin and his family moved from West Seattle to Issaquah. But he continues to make the trek to West Seattle.